The level of understanding of machinery dynamics is higher today than was ever thought possible 35 years ago. In fact, a major source of excitation was overlooked and thought to be coming from aerodynamic excitation forces in centrifugal compressors. The evaluation of instability mechanisms has advanced to the point that standard procedures are currently being proposed for all petrochemical rotating machinery. While this all sounds so fine, a closer look reveals that much more work is necessary to fully understand the machinery being built today and the advanced technology machinery that will be needed in future years. Most major universities are not interested in machinery dynamics research due to the low level of funding that the machinery OEMs and users have come to expect for such research programs. If this trend continues, it will eventually be left to industry to self-teach and advance the knowledge required to produce the necessary rotating machinery. This paper will address the most interesting results from the author’s current research efforts in two different areas. First, a key area of research for the past 25 years has been the proper prediction of labyrinth seal excitation in centrifugal compressors. Second, for the past 15 years, the fluid film bearing thermally induced synchronous instability has been the most interesting and widespread source of a new excitation mechanism for modern machinery. A summary of results and future requirements for each of these areas will be discussed in the conclusions and recommendations. The author is thankful to his current and former students who have been involved in the research work discussed in this paper, especially Toshio Hirano, Dr. Zenglin Guo and Dr. Avinash Balbahadur. 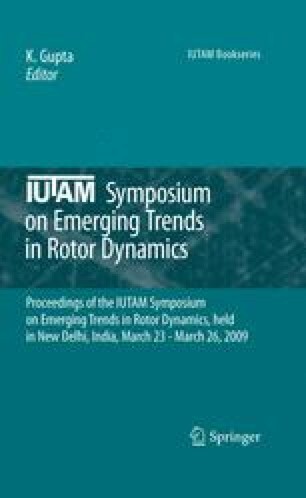 Thanks are also given to the Virginia Tech Rotordynamics Industry Affiliates Group who have sponsored the majority of this research, with special thanks to Dr. John Nicholas, John Fulton, John Platt, Fred Evans and Dr. Ed Memmott.